I live in Illinois and my parents live in Michigan. We both LOVE Happy Joe's. 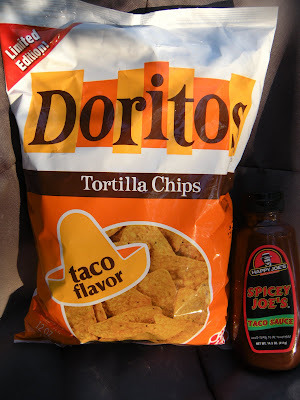 She found Happy Joe's Taco Chips on sale at Big Lots for $1.50, they sell them for about $3 in the store! She brought a bag down to us and now I'm going to use your recipe to make our very own Happy Joe's Taco Pizza! Thanks! I said the same thing when I saw the Doritos at the store! I had several birthday parties at Happy Joe's when growing up in Iowa. The black olives came with the Taco Supreme that also added sour cream I think. I always have this when I go back home to visit. I can't wait to try the recipe. Yum! I'm making this tonight since I now live in Austin and have a crazing for it. Could you also post a replicated recipe for the nacho pizza? Kristen, I have never had a HJ Nacho pizza....am I missing out? Now that it is finally fall, I am in the mood for Canadian Bacon and sauerkraut! I live in Austin too. Maybe we should get a pizza joint to offer same. 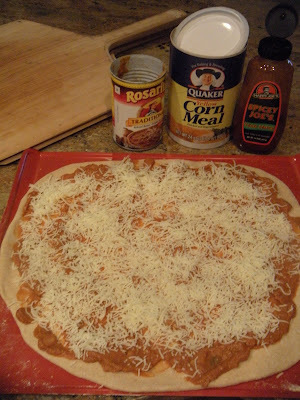 You can make a Happy Joes Nacho Joe pizza by following the same recipe except instead of using the mixture of refried beans and pizza sauce as the sauce, use a can of plain nacho cheese sauce instead. Thank you so much for the recipe. Since we moved from Iowa we have been searching for a comparable Taco pizza only to go home disappointed each time. Making this for dinner tonight!! I Worked at Happy Joe's while I was in high school. You are frighteningly close on this. The Taco pizza came regular and supreme. you have described the regular. The supreme had black olive and onions cooked with it and a layer of sour cream added before the lettuce. Ha! Jason, I knew I was close because it totally takes care of that home town craving! Thanks for the affirmation! I'm from the Illinois side of the Quad Cities but have long since moved away to Texas. I miss Happy Joes and their wonderful food (between the taco and BLT, the taco wins by a small margin but I love both). People here give me an odd look when i mention taco pizza (no one here makes one, something that makes me want to cry) so I really miss Happy Joes. I was getting a craving for it so I tried to find something and found you. YES! I cannot wait to try this! Thank you! I have a really dumb question...why is there corn meal pictured? I think I missed something. p.s. NACHO Joe is my FAVORITE!!!! Finding this recipe made my day. I grew up in Illinois and we had a Happy Joe's in my hometown. I try to have the taco pizza whenever I go home. The taco chips, the sauce, the refried beans... wow. LOVE it! The corn meal is to allow the pizza to slide on and off the rack and pizza peel. It does add a little crunch to the edges where it sticks, but it really is just for sliding. Kind of like the bowling alley arcade games we played in the Midwest where you sprinkle the fine sand to make the puck slide! Love happy joes!!!! Grew up in Moline, now live in Chicago. Love that my oldest wants to go there now when visit home! Thanks for sharing!! The best knock off I've had! Wish we had happy joes in MA. If you want to do the special the tip is to drain the sour kraut and then put it in paper towels and get all the moisture off. :) delicious! I am so going to make the Canadian Bacon and Sauerkraut! Sounds like a good summer thing...stay tuned! Thanks for the reminder Kalena, and I can't imagine there isn't some GREAT pizza in MA!